April 24th and 25th presented a couple of opportunities for severe weather across the Great Plains and lower Ohio Valley, so I left Michigan on the 23rd and overnighted in Cameron, MO. Cameron has become my goto town for sleeping if I’m heading out to chase the Plains and leave the evening before. Anyway, the 24th presented two targets for chasers. 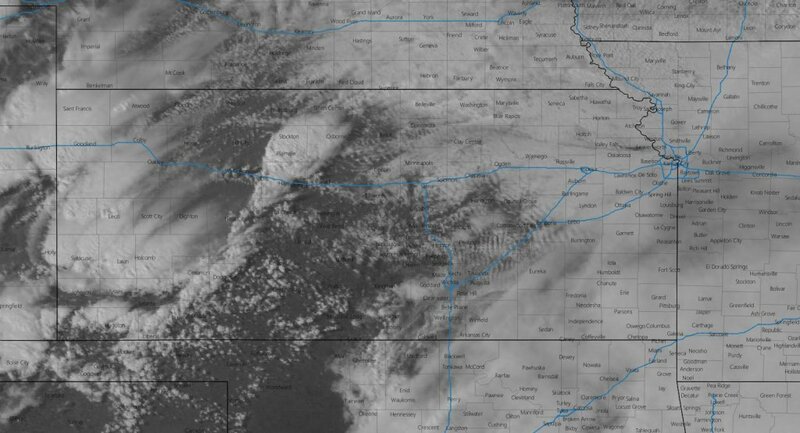 The first target area was Central Kansas where a surface low and slow moving warm front provided a focus for severe weather. The second was Eastern Texas where a warm front/outflow boundary was being intersected by a rapidly advancing dryline. Both areas were delineated in an enhanced risk from the Storm Prediction Center, although the Texas play had higher tornado probabilities. The Texas target looked to be near the right exit region of a rather strong 125-145kt H3 jet streak, the nose of which pointed towards the Kansas target. 500mb trough was rotating through the Four Corners region into the Central and Southern Plains with H5 jets around 70kts. The two target areas were separated by an area of ongoing overnight convection that would be a key factor in the evolution of storms in the Arklatex region. On the drive overnight, I had contemplated making a play for Texas, but decided on the Kansas play because I was also looking to play in the Ohio Valley the following day, and driving for Texas may have made that rather difficult. When I travel out beyond 500 or 600 miles, I prefer to string together two or three chase days to make it worth the trip. So, I had my target set for Salina and moseyed on down I-70. I met up with Brad Goddard in Salina where we sat waiting for visual satellite to give us a clue. 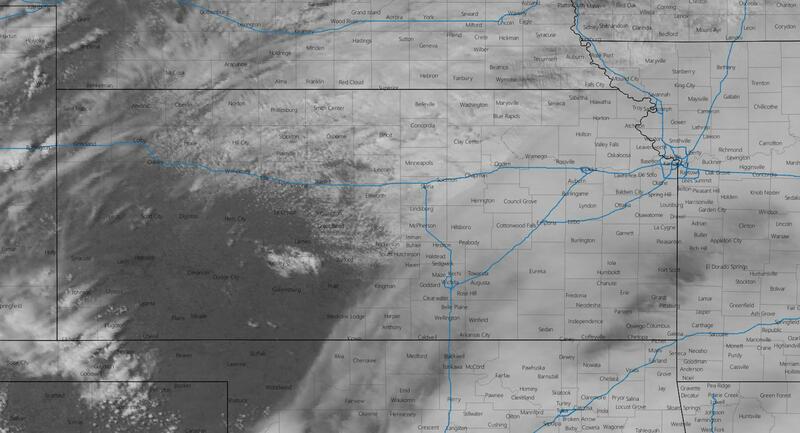 At about 19z we began to drift west on 70 as the cumulus field near Hays was starting to look pretty good. Shortly after we began moving SPC issued a mesoscale discussion for the area with all modes of severe weather possible and the tornado watch followed shortly after just before 21z. The cumulus field began to get pretty agitated west of Hays right around the time of the watch issuance and by that time we were in Russell watching the development to the west. 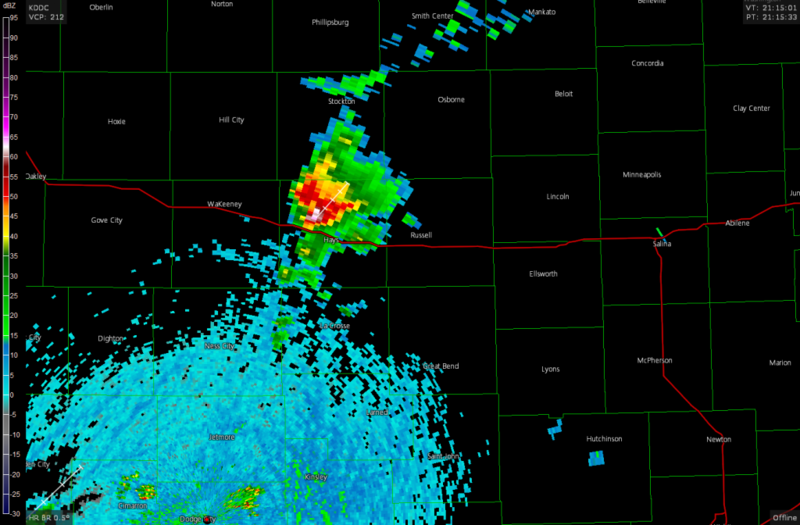 The storm went tornado warned at 2115z and we moved to intercept it. 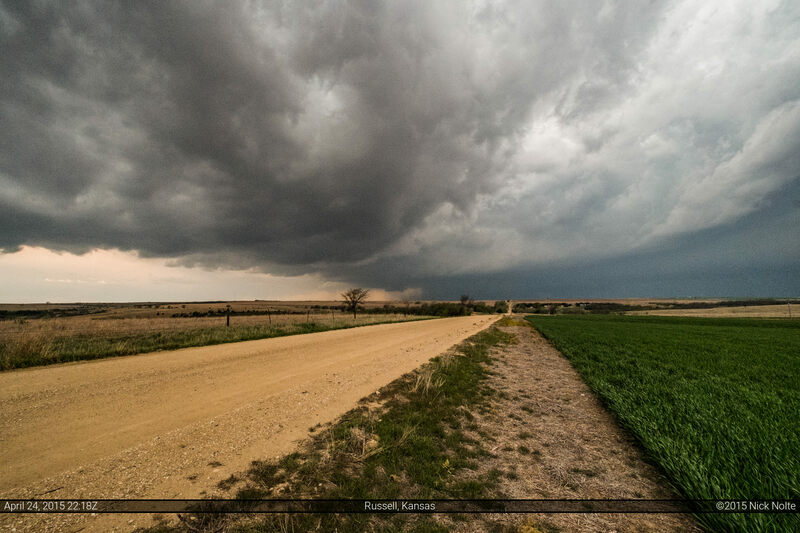 Eventually we caught up with the storm shortly before 22z as storm relative velocities started to look pretty good and the storm got its second tornado warning of the evening north of Hays. 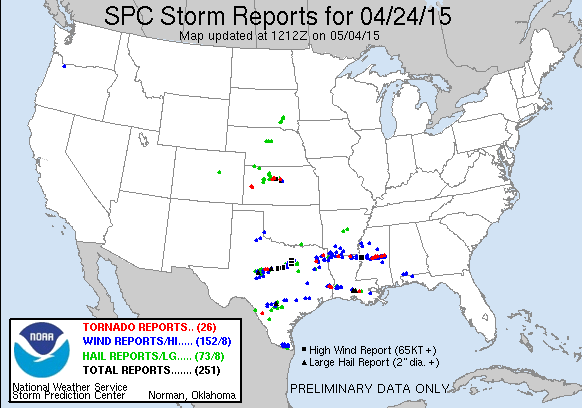 Tornado reports came rolling in shortly before 22z and video from other storm chasers shows that there may have been two tornadoes, not fully condensed, that were rather brief. From our vantage point we could see the lowered wall cloud, but were never able to see anything tornado below it. The road network in this area left a lot to be desired as our north route to highway 18 was cutoff by the storm and the Wilson Lake reservoir pretty much makes east not an option without going back to I-70, so we did that and reintercepted the storm southwest of Sylvan Grove shortly after 23z and it was quite a bit lackluster and darkness was setting in so we called the chase shortly thereafter. I headed to Columbia for the night with plans to mess around in southern Illinois for Day 2 while Brad wasn’t sure if he was chasing the following day and ended up heading back to Iowa.